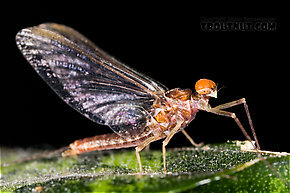 The behavior and habitat of Ephemeroptera. 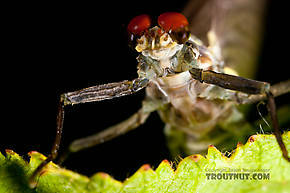 67 underwater pictures of Ephemeroptera. 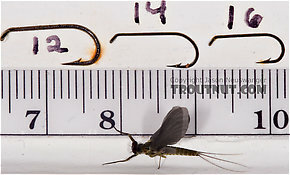 2 streamside pictures of Ephemeroptera. 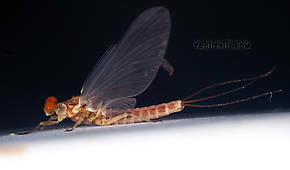 Male Ephemerella aurivillii Mayfly Dun View 14 PicturesThis is the most widespread species of Ephemerella, and also the most abundant in some places, but nobody I've talked to seemed to know what its duns looked like, and there were no pictures of its duns online or in any angling books. 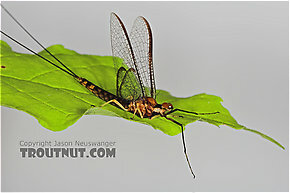 That mystery is solved with this male dun, which hatched from a definitively identified nymph. 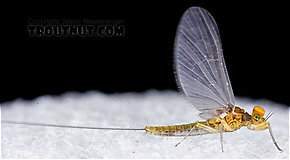 Male Baetis (Blue-Winged Olives) Mayfly Dun View 14 PicturesThis dun molted most of the way into a spinner (though the wings got stuck) the evening after I photographed it, so I took some more photos of the spinner. 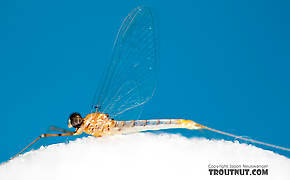 I found a female nearby, probably of the same species. 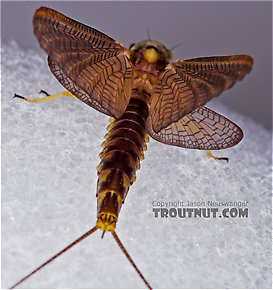 Female Hexagenia atrocaudata (Late Hex) Mayfly Dun View 14 PicturesI found this lone Hexagenia atrocaudata dun fluttering by herself on the surface of a small, still stretch of river one evening as I paddled home from fishing for smallmouths in the warm August weather.